The RNC can’t do anything right when it comes to doing things on the internet. From website to shining website, it is a parade of failure! Let’s go marching, shall we? First of all, the RNC has itself a minority problem. We all know that, but thanks to the RNC, we now know that all minorities are interchangeable! 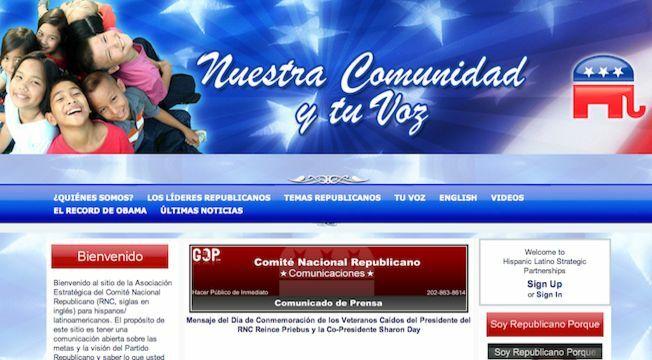 Thanks to RNC Latino, who decided to use photos of Asian kids as its headline banner of Latinos. Whoops! At least we know who designed the website, Former Nevada Senate candidate Sharron Angle! This takes "all look same" to new heights of dumb! The parade doesn’t stop there, because the RNC is honest. And by honest, I mean totally dishonest and completely stole a DNC website to use for their own! The best part of this is the website they are using it for is to say that Obama doesn’t have any ideas! This is the most ironic thing to happen since Alanis Morissette was killed by 10,000 spoons on her rainy wedding day.